Another Long Walk: Total Solar Eclipse Update! When rating natural wonders on a scale of 1-10, a partial solar eclipse might be a 7, but a total solar eclipse is 1,000,000! It's just off the charts. It's something to remember for the rest of your life. 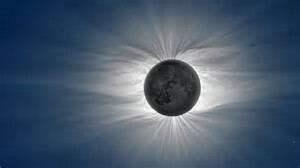 When the Moon's shadow sweeps over you, the sight of the Sun's glorious corona is indescribably beautiful. Yep, that's a person who speaks from experience, and I agree with the sentiment 100%. Some of you, I know, might not be able to get yourself to the path of the total solar eclipse, and I'm truly sorry for you. Fortunately for you, you won't actually know what you missed! You might know you missed something special, but you really won't be able to comprehend what a magnificent show you really missed. Nothing can prepare you for the visual splendor of a total solar eclipse. No photos can do it justice, and nothing in your wildest dreams could match what you'd have seen in real life. But even if you have to relegate yourself to seeing merely a partial solar eclipse, it might still very well be the most impressive solar eclipse you've seen, and if you're near the centerline where the sun is at least 80 to 90% covered by the moon, you're still in for a treat. You'll still be able to see the light getting dimmer and temperatures cooling. You'll still see crescent suns covering the ground as light filters through the leaves of trees overhead. You'll still see a magnificently large chunk of the sun with a dark bite taken out of it. But as exciting as all that is, unless you can take of those solar filter glasses and see the sun's corona with your own eyes, you'll be missing the main event. That's why a 99% covered sun is nothing compared to 100% totality. You still can't take your eye-protection off, and the sun will still be too bright to see the corona. It's literally the difference between night and day. It's absolute magic when the last bit of sun winks out and totality emerges. In 1973, a supersonic airplane chased the moon's shadow during an eclipse. This extended totality to those on board to 74 minutes as the airplane kept pace with the shadow. I am sooo jealous of those people on board! Seventy-four minutes of totality?! That would normally require seeing about 20 total eclipses which would take decades! Fewer than 1 person in 1,000 has ever seen totality. You won't just be part of the 1%--you'll be part of the 0.1%! The corona is part of the sun's outer atmosphere and is a super hot 2-million-degree plasma. Okay, I knew that one already, but it's still fascinating to me. Two million freakin' degrees?! Even iron becomes a gas at those temperatures! Emperor Louis of Bavaria witnessed a total solar eclipse on May 5, 840. He was so terrified by the event that he died shortly afterwards. (And when you witness a total solar eclipse, can you imagine how scary that would have been if you weren't expecting it and didn't know what the hell was going on? You could easily imagine that a lot of people at the time thought it was the second coming of Christ!) A quarrel between his three sons over Louis' succession led to the Treaty of Verdun, dividing Europe into France, Germany and Italy. It takes just 90 minutes for the moon's shadow to cross the United States from Oregon to South Carolina. That's because the moon's shadow will be traveling across the planet from anywhere between about 1,500 miles per hour to 2,500 miles per hour depending on it's location. The shorter totality is, the faster the shadow is racing across the ground. So it'll be fastest in Oregon and South Carolina and slowest in Illinois. But let's face it--1,500 miles per hour is still pretty darned fast! The speed that an eclipse travels across the planet is amazing, and one of the things I like to do when I've watched total solar eclipses (and annular eclipses) is track where on the planet the eclipse is happening. It's fun knowing that the eclipse has touched down in some distant part of the world and is now racing across the planet at fantastic speeds while you're on an intercept position in some hopefully cloudless location. 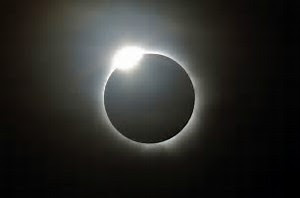 It includes the start and end of the partial eclipse in the Pacific and Atlantic respectively--as well as the start and end times of totality at those extremes. And between them, it'll list at what time totality crosses each state line as it passes through America. You can copy and paste whatever list is applicable to you into your favorite editor then add your own eclipse information for your specific location to it. At your location, there are four times to keep track of called 1st contact, 2nd contact, 3rd contact and 4th contact. Not very creative, I know, but I didn't name them! You'll have over an hour between 1st and 2nd contact, a couple of minutes between 2nd and 3rd contact, and another hour-plus between 3rd and 4th contact. If you aren't in the path of totality, there will be no 2nd or 3rd contact. Anyhow, add your 4 points of contact to this list--which you can look up for your location on NASA's eclipse map--and on eclipse day, have it printed out and follow the path of the moon's shadow racing across the earth. Let everyone around you know what's up to. Another ten minutes later: "The eclipse crossed into Wyoming!!!" I'm counting the minutes, I'm so excited! And yes, there are countdown apps for crazy people like us! Where I'm going in Oregon we have a 67% chance of clear skies! Make it 100! Thanks for posting, Ryan! Post 14: School is in session! Post 8: Of Knights and Dragons! Post 7: Welcome to Kraków!